Putney Way works will get underway mid February, with the street upgrade programme finishing before the station’s public opening in April. 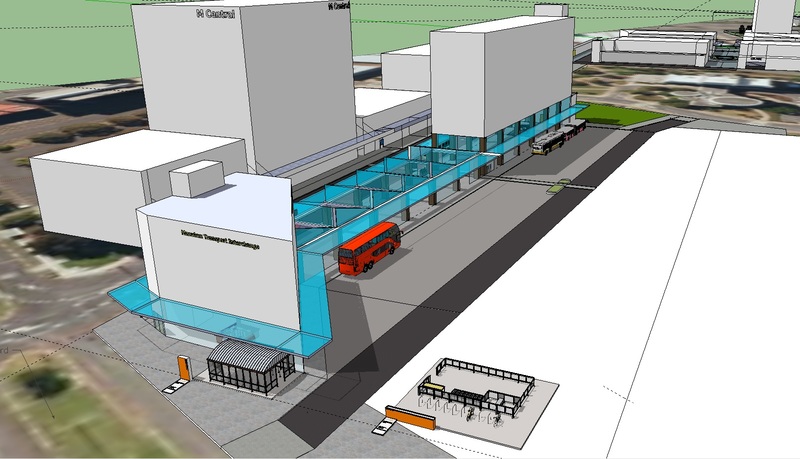 The bus station is set to open in April and I should be feeling excited that a focal point in Southern Auckland’s transit is about come into operation – except I can’t! Just look at Auckland Transport’s excuse for bike parking. I am sure they spent more money on the sign pointing out the bike parking than the bike parks themselves. Seriously though eight bike park spots outside the bus station building for what will be the busiest transport interchange outside of the City Centre and Auckland’s largest Metropolitan Centre? I am not sure if Auckland Transport is insulting our intelligence but the provision of bike parking is extremely (for a lack of better words) piss poor for such a critical transport interchange! For a transport interchange the size of Manukau a fully lockable bike cage with self-service repair facilities and enough storage for at least 100 bikes (with the potential to add more on as demand grows) should have been a absolute bare minimum. When I submitted to Auckland Transport I asked for such biking facilities to be installed. But no 67% of submissions which were negative or neutral to the designs of the station were ignored with the entire project feeling more of a vanity project than one of practicality. April is when the bus station opens – and do not even get me started on the missing apartment tower above the station either.